I didn't attend many concerts this year like last year. But the first concert itself was overwhelming. Here, at Kalakshetra, Besant Nagar, an Annual art festival is going on now. Nowadays, I have started enjoying Hindustani music. Though I am familiar with the famous singers of Hindustani music, the name of Pt./Prof. Venkatesh Kumar is new to me. Even last year, I had attended a concert of a singer whom I hadn't heard much before, Ms. Lalita Sharma and it turned out to be a very good one. Now, Pt.Venkatesh Kumar was very good. The 2.15 hour concert took the audience to another level. Kalakshetra's audience are always very devoted to music, as far as I have seen. People come and sit before the concert starts and nobody leaves in between the songs. This time the whole crowd sat through the whole concert and he had a standing ovation for a long time. The auditorium is not very big. The ambiance, even without the a/c and nearly open area with a roof and side coverings, it was good to hear soulful music in a homely atmosphere. Kumar learnt Hindustani vocal in the Gwalior and Kirana gharana styles under Gawai. Kumar blends these styles effortlessly in his presentations, though he admits to influences beyond these gharanas, chief among them being Ustad Bade Ghulam Ali Khan of the Patiala gharana. 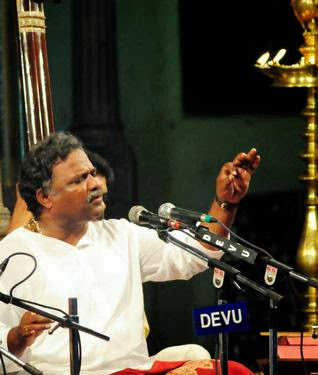 His guru was also trained in Carnatic music, and as a result, there are traces of Carnatic elements – especially in his sargam patterns – in Kumar’s music. He has got a booming voice like Pt. Bheemsen Joshi and Pt. Jasraj. Sometimes loud voices irritate the ears, but the whole crowd was enjoying his music, applauding whenever he sang a beautiful gamak. We cannot hear Hindustani music singers using sargams in the old records normally. But nowadays, Carnatic music is influencing Hindustani music and they have started using sargam even in aalaap. Pt.Ajoy Chakraborthy liked the sargam way of singing so much that he had started learning Carnatic music from Sri Balamurali Krishna, it seems. He said so in a concert last year. I heard that Carnatic music singers have started learning Hindustani music also which trains the vocal chords better, it seems. Pt.Kumar is still working at the University College of Music, Dharwad, which prevents him to turn down important concerts. But wherever he sings, he gets accolades which cannot be forgotten. He has won many awards...I should have noted them down when they listed it out at the concert. He sang raag Poorya Dhanashri for nearly an hour and then Raag Kedar and a Purandara dasa kruthi. A Bhajan in the end. Because of the time limit, he could not entertain us further even though the whole crowd wanted to hear more. Now, to some music of Pt.Venkatesh Kumar. Raag Kedar can be heard here. I look forward to hearing his music again, in the years to come. I went to the dance programme of Ms. Shobana, last week. I don't know much about dance, but out of curiosity, I went there, to Narada Gana Sabha. I can understand why she has become so famous. Her movements are very smooth. 2 dances were from Geeta Govindam, which is about Krishna. The last one was unbelievably good. The subject was Dashavataram. All the avatars of Lord Vishnu, were shown so well in the dance form, with other dancers. It is difficult for me to explain We, normal people also could recognise the shapes of the 10 avatars of Lord Vishnu - MATSYA (The fish), KURMA (The tortoise), VAMANA (The dwarf), NARASIMHA (The half lion half human), PARASURAMA (The sage), RAMA (The King of Ayodhya), KRISHNA (The King of Dwaraka), BALARAMA (Brother of Krishna) and KALKI (Eternity or Time, 'The destroyer of evil' who is expected to appear at the end of Kali-Yuga). Well, I am not a good dance programme reviewer! I enjoyed her dance. Here is one video of her dance. She was a good movie actress. Remember 'Mitr, my friend' She has acted in many other South Indian movies. More than a good actress, she is a good dancer, it seems. But no more dance programmes for me. I enjoy music more! I too prefer music over dance/other art forms, but maybe with time I might appreciate dance also, like how I am slowly coming to appreciate movies now. I will come back to listen to the performance embedded here. I want to listen more of Hindustani music. I should have gone to at least one Carnatic concert this year, but missed. Next year maybe. DESTINATION INFINITY: We have to concentrate a lot on the subject of the dance. Then we might appreciate it more. It is a great art and a difficult one to achieve. I had watched Padma Subramaniam's 'Krishnaaya tubhyam namaha' in my school days. It was about Krishna's antics and I knew the story. God, she showed the whole story in abhinayas...the same lines will be repeated by the singer and she will tell the story with abhinayas. It was incredible. Shobana was equally good. But I was not grasping properly. Dasaavataram was very good. I couldn't get a proper video from 'you tube'. She is very good. This video is proof of her talent to some extent. She was better on the stage. Music season is still there. Bombay Jayashree is singing on 27th at Music Academy and on 30th at narada Gana sabha! Carnatic music! Tomorrow Vikku Vinayakram's Ghatam at kalakshetra. We have got treasures around us D.I. We should appreciate them. HITCHWRITER: I seem to hear music from morning to night...radio is still my preference. I listened to the song you have mentioned here. Jagjith is always my favourite. This movie also was interesting! Thank you, Dhiren! Pt.Venkatesh has a beautiful voice and it was a nice video you posted.Shobhana is actually a good dancer. But such expressive classical dances must be performed in quiet, sedate,softly lit environment rather than on brightly lit razzle dazzle noisy disco kind of stage which takes away the focus from the dancer. RAMAKRISHNAN RAMANATHAN: Yes, Pt.Venkatesh Kumar has a booming/clear voice. The videos are not from the concerts I attended. We are not allowed to even photograph the artists when they are performing! These are videos I took from 'you tube'. Shobana danced for Gita Govindam and Dashavatharam...they were too good. The concert was at narada gana sabha and the jil jil lights were not there, thank god! Thanks for the wonderful review. Will remember this when they visit California. SG: Venkatesh Kumar is still working. So, don't know if he is performing abroad. But Lalita Sharma does. She is a Carnatic and Hindustani classical singer. She is very good. So good to read about the dance and music in this lovely post Sandhya! May the New Year ring in with the recital of more melodies in your life! Nice and interesting post :) I have checked the videos and good to read about the description of the dance movements. RAHUL BHATIA; Thank you, Rahulji! Our best wishes to you and your family too! SandhyaMa, your taste in music is really high. I remember a post you had done on Pt. Bhimsen, and that day I played Bhagyada Lakshmi Barramma all day on loop after hearing it on your blog! Yes, music is one of the highest forms of art and I'd love to know it better. CRAFTY SHINES: I had forgotten 'bhagyada lakshmi' and now I am playing it again! Normally we sing in another tune. His voice and tune takes the song to a higher level! Music is a great tension reliever for me! Keep hearing all sorts of music and you will start liking nearly most of them. All types of music has got a unique flavour I feel!